It is important to get your cars air conditioning maintained and serviced by an air conditioning specialist to avoid any mistakes or flaws in the system. Some individuals maintain that it is possible and safe to re-gas an air conditioning system but it is probably a good idea to leave it to the experts. It is a good idea, however, to understand the system so you know what the specialists are talking about and referring to when they maintain, repair and re-gas your air conditioning system. 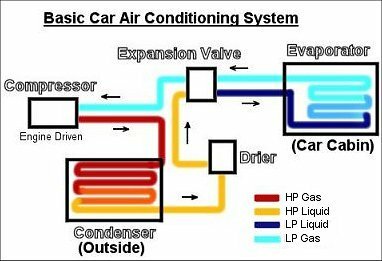 A vehicle air conditioning system regulates the air temperature within a vehicle to maintain a comfortable driving environment for the driver and passengers of a vehicle. Because vehicles are made from metal substances and have glass along most of their sides, both the cold and the heat get in very easily and can make driving in either very hot or very cold weather unbearable for both the driver and the passengers. The air conditioning system helps to cool the car down in very hot weather by pushing the hot air outside of the vehicle and cleaning, cooling and drying any new air that comes in. Usually, most car air conditioning systems are manual and you will have to turn them on yourself when you need an air conditioning. Some newer, more high tech cars now have automatic air conditioning systems that will work without any buttons being pushed. The system recognises the air temperature and the climate and then will turn on automatically. The temperature will decrease to a comfortable level and the vehicle will become comfortable for both the driver and the passengers. When do you need air conditioning maintenance, repair or re-gassing? There are several ways that you can tell that your air conditioning system may need servicing, re-gassing or something of that kind. If your air conditioning simply stops working it could need repair or re-gassing and you will need an air conditioning expert to check your vehicle out and tell you what is wrong. Another common issue is that the air conditioning system is not getting cold enough. This is usually due to the fact that in winter, the air conditioning system is not used enough and the O ring seal dries out. Another problem that a lot of people experience is that their air conditioning starts to smell bad whenever it is turned on. This is caused by a vehicle air conditioning that is not used frequently. When this happens, bacteria and mould can begin to grow within the system which could cause unpleasant odours. This is quite a serious problem as it can also cause health issues for drivers and passengers. Many people will experience headaches and flu like symptoms, commonly referred to as sick car syndrome. If your air conditioner begins making noise you do not usually have to worry. Clicking as the compressor pump turns on and off as it does its job is quite normal. However, if the noise changes suddenly or becomes louder, you should definitely get your air conditioning system check out as it may be cause for concern. If you notice a puddle of water on the floor in either the drivers or the front passenger’s foot area, there is not usually a problem. Generally this is just the air conditioning condensation dripping out of the tube. If you are looking for car air conditioning specialists and re-gassing service staff there are a great number of companies that will be able to help you with your air conditioning system. Some of the companies that you can contact include Air Con Repair Service, Cape Town Air Conditioning, Auto Air Con, Harrack and Dunair.